My oldest son was home for a visit back in April. They moved to Seattle last November after their October wedding. They love Seattle and I am hoping to see their new home this summer when I take a trip there myself. The story that my son told that I thought was fun about their new home, other than Seattle being an incredibly “green” city, was that his new bride had embraced this green-ness by competing against the other residents in their apartment building with overall water usage. The funny part of this is that the other residence weren’t aware they were in a contest. Thomas and Bell live in a building that houses about six apartments that all share a garage like space on the bottom level for their cars etc. Each apartment’s water meter is also in this garage and as they would come into the garage, Belle would look at each apartment’s numbers on their perspective meters. She was trying to gauge how much water they were using in comparison to her neighbors. When she realized that the numbers didn’t reset at the beginning of the month, she kind of gave up because it would mean that she would have to set up a spread sheet and do a daily check of the numbers to see if they were ahead or behind. I just got a kick out of this story and the competitiveness of my new daughter-in-law. Belle came to visit this week and I brought up this story and we laughed about it. She then said that I would be disappointed with how she washed dishes after I shared how I had noticed other people’s dish washing habits. I’m now wondering how this trend has come about and if people even think about their water usage in terms of what is going to save them the most. The way I look at it, every drop that comes out of my faucet is paid for by me and I want to make that money count with every drop. So, I thought I would share how I try and conserve water in my house and see if I can get any of you to help all of us to save even more water. This trend that I spoke of to Belle, and which she confessed to doing, is washing dishes with the faucet running the entire time, no stopper in the sink and a continual stream of water going down the drain. I have witnessed this on many occasions, mainly with my kid’s generation. When I was growing up, you would clean out the sink, and add the stopper and then fill the sink with your hot dish water and soap. Your companion sink, either to the right or left, depending on how your set up is, is filled with hot rinse water. As you wash your dishes you then dunk them into the hot rinse water and stack them into a dish drainer. NO additional running water. I would estimate that you probably are using about 3 gallons of water total. Two for the washing and maybe a gallon for the rinse. In times of drought here in Virginia, I have used a plastic dish pan in the sink to wash the dishes in and rinse the dish above that dish pan of wash water capturing ALL the water and then that water in used to put on the garden in the evening to help keep a plant alive during those dry spells. I believe this is probably the best way to truly salvage all the water and not let any of it go down the drain. I’m told that using the dishwasher is absolutely the best solution because it uses the water in the most efficient way. However, I see people washing their dishes in the running water method BEFORE they then load them into the dishwasher. While most dishwashers, mine does, should be able to handle the dirty dish without even rinsing off the foodstuff, I understand that some don’t and the dishes may need a little help before they go into the dishwasher but I believe that you could probably get away with a good scraping with a rubber spatula into the compost or trash instead of involving any water at all. I worked at a YWCA camp one year in college and each table had a rubber spatula that the kids were required to “squeegee” their plate before stacking them up, eliminating the extra pre-washing before loading them into the commercial dishwasher in the kitchen area. I use a lot of water conservation techniques in my pottery too. I have a dishtub in the utility sink in our basement and try at all costs to avoid any of my chemicals going down the drain. That dish pan gets really full of waste water and maybe gets dumped out into my grass once a month. That same water is used to wash out brushes, containers, glaze buckets and even rinsing off my hands before I finish for the day. 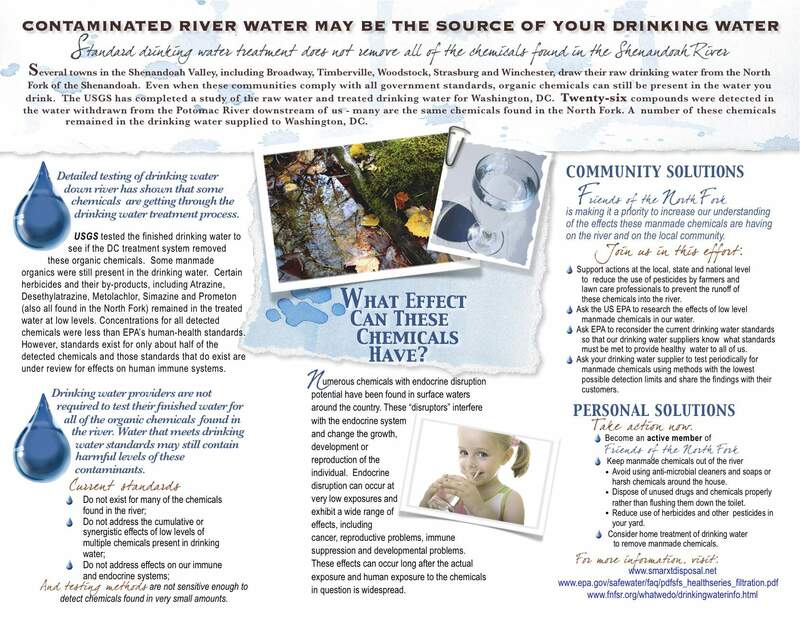 This topic could obviously be a completely new post due to all the chemicals that get flushed down the drain daily and end up in our watersheds. My hope is that you will share your dishwashing techniques with me and help others to think more about their water usage and maybe even get into the competitive spirit of my sweet daughter-in-law, who is having fun trying to save the planet in her small way in Seattle. Good luck Belle and I hope you can figure out a way to get your neighbors involved in your game! I really love the spirit of this idea! Warning: this posting could save your life!!! Many of you remember in late 2010, I built and planted cold frames in my backyard after reading Eliot Coleman’s book “Four Season Harvest”. I wanted to see if I could also have fresh greens year round living in Zone 6. I didn’t realize just how wonderful it is to have these fresh lettuces and greens and the different flavors that they have. They are, or seem, much more tasty than those that you can get at the grocery. And there is certainly so much more variety than I can buy locally. At least in my local grocery store. This spring, one of my favorites was this salad green mix called Elegance Greens Mix from Johnny’s Seeds. This mix included Pac Choi, Red Mustard, Mizuna, and leaf broccoli. In addition to this mix, I also have a deer tongue lettuce, a butternut lettuce, a romaine and claytonia and spinach and chard. All of which, when you cut and mix them in a bowl with some salt, pepper and olive oil are unbeatable. So last week sometime, I cam across a Facebook posting about a documentary called Forks over Knives and added it to my Netflix que. It is a documentary that discusses a strictly plant based diet and how if we were all to switch to this that many of our diseases would disappear and certainly our obesity rates would plummet. In the film, one of the scientists did a decade long study comparing the diets and disease rates in other countries as compared to the US. Many of the countries didn’t have the same diseases that we have here in the states and now that many of them are adopting the western diets they are now seeing the diseases come into their populations. In the film, they follow at least three people who have serious health problems and you watch as they spend time with a physician who helps them eliminate their meds by changing how they eat. The physicians actually take them shopping and show them how to prepare the foods. Each of the people lose weight, feel more energetic and aren’t dependent on a pill to change how they live. I think that we have become so dependent on medicines to help us to fix our health that it never occurs to us to just try to change our diets. Or eliminate things from our diets. The food industry as well as the drug industries are making money from our dependence on all their products. I would much rather give my money to Johnny’s Seeds for my lettuces and vegetables than to the drug companies and for genetically modified foods. I have been trying to shed a few pounds with the upcoming wedding of my youngest son and had been trying to eat as many of the lettuces up before the summer heat takes over and takes them away for a few months. I have been also using the spinach in smoothies that I make for myself in the evenings as a healthy snack. I use a sugar free vanilla ice cream, just a scoop or two, a couple of dollops of fat free yogurt, a handful of almonds, about a cup of frozen blueberries and a couple of handfuls of fresh spinach leaves. When the mix is blended I throw in ice cubes to give it a frozen drink feel and I have to say it is yummy. After watching FOK though, I think that I need to find an alternative to the ice cream and yogurt. I’m not sure that I can totally go to a full plant based diet, but I know that I can cut back on the my meat intake. I know that if all of us were to have even a couple of days a week that we eliminate meat that our planet would be better off. The film goes into some of the statistics of ratios of cows on our planet to people and the aspects of taking care of all those animals. I highly recommend this documentary! It certainly opened my eyes to myths that I think we all have about some of our foods and what effect they have on us. And I certainly wish that many parents of small children could see this and the kind of future that they may be facing in a world where it seems our food is not so good for us anymore. In the meantime, I’m going to check out the recipes and see if I can find something yummy for lunch to have with my salads. Anybody want to join me? On Mother’s Day I did my first official venue as a potter. For those of you who are not familiar with this event, it is held at the State Arboretum, Blandy Farm, in Boyce, VA and is a wonderful way to welcome Spring if you are a gardener. There are all kinds of native plants and annuals and perennials. In addition to planting material there are garden objects (birdhouses made out of beer cans, sculptures, windchimes and chairs), handmade soaps and lotions, and garden tools. I was too busy to get out of my booth to take some shots of the vendors that were there but some of the companies that I could see within my site, I think, gave a good representation of what was there. 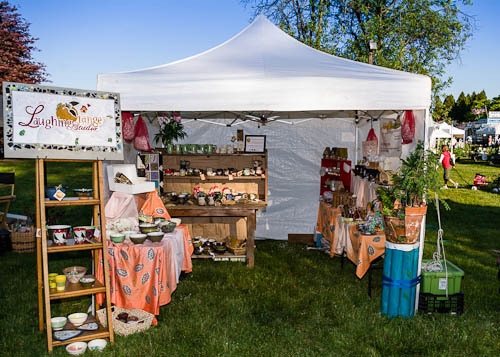 Companies like, Peony’s Envy, The Bumblebee Studio, Horizons Ltd., EZ Hang Chairs and lots of garden nurseries. I could also see the llamas from Sunset Acres where I was located. In all, there were over 100 vendors. The biggest draw for my booth was the broken planter fairy garden. It was located at the corner of my tent and we used it to anchor that corner due to it’s heaviness and allow it to stabilize the tent from wind gusts. We were amazed at the way this garden was like a magnet that drew people into the tent. They would ask to take photos of it, they would bring people back to look at it, they would smile and compliment it. At that time, I would invite them into the tent so that they could get all the accessories to go home and make one of their own. Almost instant sale! 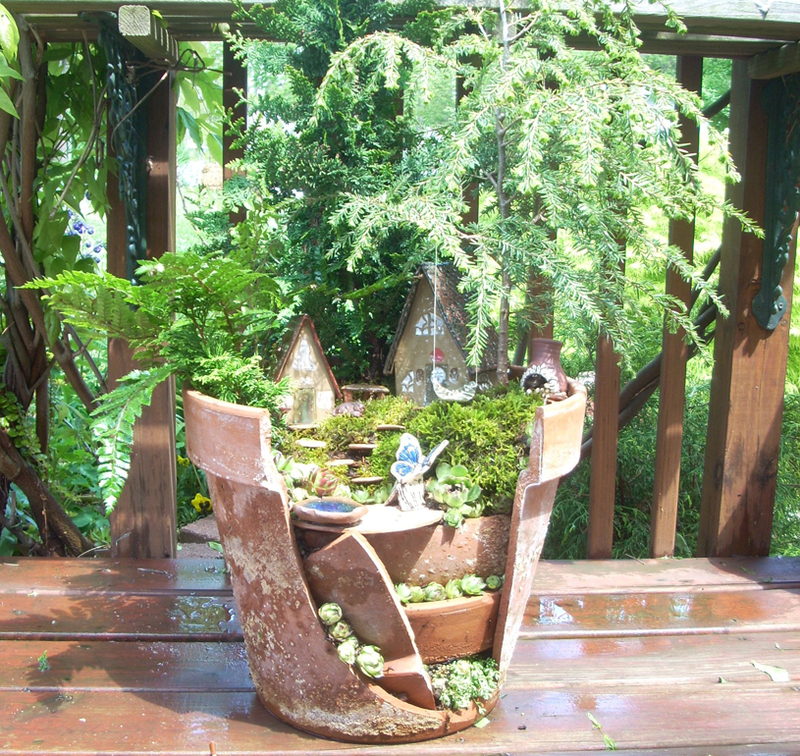 I had no idea how popular this trend had become until I was picked up by the blog, Backyard Herbal Patch Herbal Blog, who gave me as a source for fairy garden accessories and showed this photo of the planter. I got a Facebook message from a lady from The Succulent Perch telling me that the photo had gone viral and had been shared over 1700 times. This was before the garden fair at Blandy, so I used this in my sales pitch. When folks wanted to take a photo, I would tell them about the number of shares on the web and that they could find the image if they didn’t get a good photo. There is a wonderful stream here in Tom’s Brook where I gather moss and such for my terrariums and for moss gardens. Herb walks by this stream every now and again and saw this tree and several stumps that he thought would make a great staging area for the items that I am making for the fairies. This morning we loaded up all the gear and a few of the items and drove to the spot and set the fairies up with a village under the tree. I think it really works well and should stay green most of the summer for future photo shoots. Enjoy the photos and happy day after St. Paddy’s Day.